The RCA input is very common, but unfortunately it is single-ended. This does not in general offer the same degree of noise rejection as a balanced input. Five-way binding post outputs are great for their versatility, plus there are versions available that offer very low contact resistance (e.g. the excellent connectors from WBT). The IEC mains connector is convenient and available everywhere, but does not give the same performance as newer offerings. 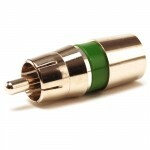 The XLR input is balanced and there are very good gold-plated versions available. The Speakon output is rated for high current, but is not quite as versatile as five-way binding posts. The PowerCon mains connector offers about one-third of the contact resistance of an IEC mains connector. 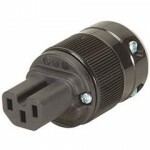 An advantage of these professional connectors is a locking mechanism that allows for robust installations. One of the biggest issues with a professional connector set is that the specialty cable market has not yet embraced them. This serves as a major deterrent to those who already own, or may wish to purchase, specialized audio cables. I hope to see this deficiency remedied soon so that audiophiles may begin to enjoy the benefits of these high performance connectors. This entry was posted on Wednesday, April 29th, 2009 at 5:57 am	and is filed under General Audio. You can leave a response, or trackback from your own site.